Python is necessary for building the modules. Go to http://www.python.org/getit/ and download the latest version, currently "Python 2.7.3 Windows Installer" (Windows binary -- does not include source), install it. Add Python directory (e.g "C:\Program Files\Python") to the PATH environment variale in Windows. We will need the MSBuild system(which is built in VC++ 2010 Express) to build cairo lib to native code. Get VC++2010 Express from http://www.microsoft.com/visualstudio/en-us/products/2010-editions/visual-cpp-express and install it. You will need the cairo library which is bundled in GTK. Download the GTK all-in-one bundle for Win32 or Win64 (these instructions used that zip). Unzip the contents in C:\GTK (if you want to change this you must modify the binding.gyp file to reflect your changes), and add C:\GTK\bin to the PATH environment variable in Windows, it's necessary for node-canvas runtime to load those libs. If you get linker errors you've most likely picked the wrong bundle. 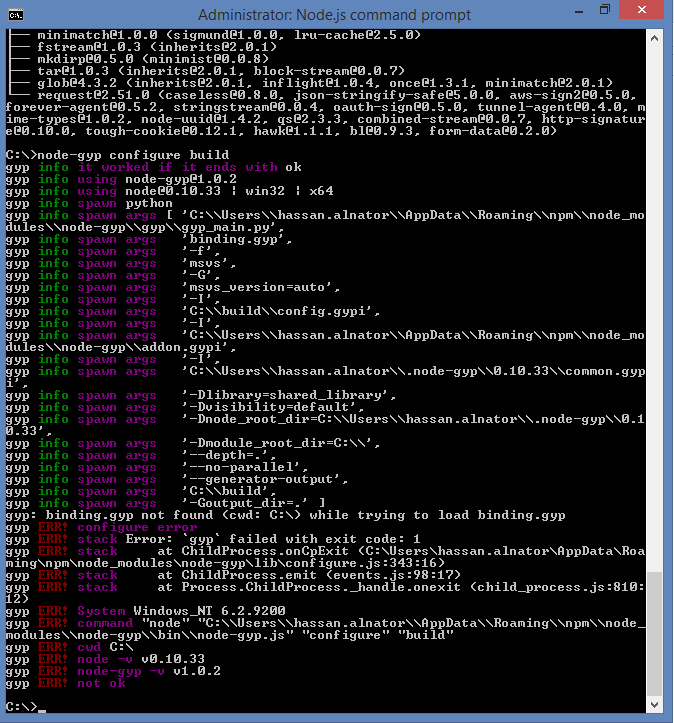 You should now be able to type node-gyp in your command prompt and have node-gyp's help screen displayed. Browse other questions tagged python windows node.js opencv node-gyp or ask your own question.